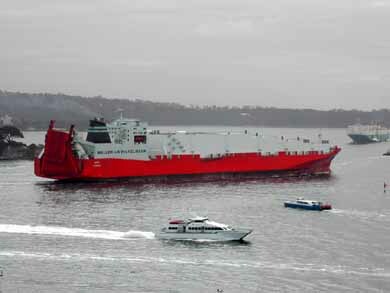 Norwegian Container vessel MV Tampa's captain, Mr Arne Rinnan, sailed into Australian waters with his deck filled with Afghan refugees in 2001, causing national and international fury with Australian PM John Howard. It was then, that Project SafeCom was established as one of the furious voices against the Australian government's treatment of asylym seekers and refugees. In September 2003 we convened a public weekend forum at the University of Western Australia under the title The Cost, the Carnage and The Bill. Now, on the sixth anniversary of the Tampa standoff, A Just Australia and Oxfam have released the report 'A price too high', while even the last of those asylum seekers who were rescued by MS Tampa are only escaping the quagmire of Howard's Pacific Solution. According to the AJA/Oxfam Report, "The Government has spent $1 billion - more than $500,000 a person - to process fewer than 1,700 asylum seekers on Nauru, Christmas Island and Manus Island." "By comparison, to process those 1,700 asylum seekers for 90 days each at the Villawood detention centre in Sydney would have cost around $35 million: around 3.5 per cent of the cost of processing them offshore." In the six years since the Tampa crisis in August 2001, Australian taxpayers have spent more than $1 billion to process less than 1,700 asylum seekers in offshore locations - or more than half a million dollars per person. Most, if not all, of these asylum seekers have paid a substantial personal toll through poor mental and physical health and wellbeing. There have also been detrimental impacts on Australia's democratic and legal system, Australia's regional relationships and the international system of protection of refugees and asylum seekers. This report - a joint project of A Just Australia and Oxfam Australia, with support from Oxfam Novib in the Netherlands - analyses the costs of the policy known as the "Pacific Solution". It critiques government claims that the policy is an efficient and effective means of achieving refugee protection and immigration control. The costs examined in the report are human costs, financial costs, cost to Australian rule of law and democratic system, costs to the region and the cost to the international system of protection. Detainees held in offshore locations often bear the brunt of the policies through poorer mental health and general well-being, both in the immediate and longer term. There are also higher costs borne by the broader Australian community as a result of having to integrate people who have been damaged by prolonged isolation in offshore processing centres. Longer processing times in more isolated locations tend to hinder the integration of asylumseekers when they do finally resettle in Australia, and often cause loss of skills and livelihood opportunities and hence a heavier reliance on community and government care. Medical studies, figures from the Department of Immigration and Citizenship (DIAC), testimony from staff and former asylum seekers on Nauru all paint a shocking picture of psychological damage for the detainees - including 45 people engaged in a serious hunger strike, multiple incidents of actual self-harm and dozens of detainees suffering from depression and other psychological conditions each year and being treated with anti-depressants or anti-psychotic medication. In October 2005, Immigration Minister Vanstone agreed that 25 of the remaining 27 detainees on Nauru should be brought to Australia "on the expert advice of health professionals because of serious mental health concerns." The fact that their detention on Nauru had caused mental health problems was recognised to a limited degree by the Australian Government when it requested the Red Cross to deliver six weeks of initial settlement support including casework, information and referral, assistance with housing and referral to mental health support as required. A lack of hospital infrastructure and a lack of timely access to adequate physical health care saw at least 40 people airlifted to Australia from Nauru for medical treatment. A 26-year old asylum seeker with no known physical or mental health problems died on Nauru in August 2002. The detention of over 1,500 asylum seekers on Nauru has placed extra burdens on a community of only 10,000 people that was already facing major economic and political problems. The hunger strike on Nauru in December 2003 placed unacceptable burdens on Nauru's health system and medical staff. Similarly, the small Christmas Island community of 1,200 could not meet the complex physical and mental health needs of asylum seekers, nor did it have adequate resources to provide community detention and other services to the detainees. This section also documents the long delays in resettling people found to be refugees, with case studies of Palestinian Aladdin Sisalem in Papua New Guinea, and two Iraqis Mohammed Sagar and Muhammad Faisal on Nauru. The majority of detainees have spent two years on Nauru, with a smaller number being held for up to six years. As one Iraqi refugee told the authors: "Two years? It was 2,000 years. Every moment was like a year." Offshore processing in Nauru, Manus Island and Christmas Island has amounted to at least $1 billion since 2001. By comparison, the latest estimates from DIAC suggest that to process 1,700 asylum seekers for 90 days each at Villawood detention centre in Sydney would have cost around $35 million - around 3.5 per cent of the cost of processing them offshore. Interception costs: at least $100 million on increased activities by the Defence Department related to intercepting boat arrivals, with plans to spend another $51.6 million over the next four years. Australia has also made more than $200 million in payments to the International Organisation for Migration (IOM), largely to manage offshore detention centres in the Pacific, but also to provide processing and other services in Indonesia to prevent asylum seekers coming to Australia. Infrastructure, maintenance and operating costs: including $396 million for the construction of the Christmas Island detention centre, and at least $253 million (to June 2006) for the management and operation of the Nauru and Manus centres. The average cost for maintaining the facilities on Nauru is $2 million a month, while Manus Island (empty since 2004) is maintained in readiness for new asylum seekers at an annual cost of $2 million. It costs $1,830 per detainee per day to keep someone on Christmas Island, compared to $238 per detainee per day at Villawood, according to the latest departmental estimates (Figures are not given for Nauru and Manus on this basis). Transportation and Services costs: There are many other additional costs, such as nearly $5 million spent on charter flights to move asylum seekers offshore in 2005-06 alone. Millions have also been spent on other unreported costs like transporting asylum seekers to Nauru, Manus Island and Christmas Island by boat, flying asylum seekers to Australia for medical treatment, providing services to asylum seekers that are not covered by IOM and flying lawyers to Christmas Island to provide legal assistance, as was the case with the 43 West Papuan asylum seekers who arrived in 2006. Cost to the aid program and other costs: Since 2001 Australia has increased five-fold the amount of development assistance provided to Nauru, compared to the 1990s (providing over $123 million in aid between 2001 - 06). It also established a $1 million trust fund to meet the costs associated with setting up the Manus Island facility. The fourth MOU between Australia and Nauru for the offshore asylum program in 2005 - 07 pledges $40.5 million in aid over the period. A major motivation for the Pacific Solution policy was to keep asylum seekers "out of sight and out of mind." Interviewees for this report highlight major deficiencies in the policy, including a lack of legal representation for asylum seekers, a lack of independent scrutiny of offshore processing, a lack of transparency and accountability in the process and a lack of review of its outcomes. These deficiencies ultimately undermine Australians' ability to be confident that a fair and equitable application of the law will occur in their country and that governments can be held accountable for their decisions. The policies also potentially damage social harmony and cohesion. In the first few years of the "Pacific Solution", asylum seekers were denied access to legal advice about Australian immigration law and their rights of appeal. On occasions, the Nauruan government has gone to the length of denying visas for Australian lawyers or migration agents who sought to travel to Nauru to represent the asylum seekers. Positive changes in asylum seeker treatment and processing practices in Australia have not been implemented in offshore facilities. Government accountability has been damaged by the failure to provide the full costs of running the detention centres in Nauru, Papua New Guinea and Christmas Island. Since the Tampa crisis of 2001 the aid program to Nauru has ballooned. Between 1992 and 2001, Australia only gave $24.6 million in aid to Nauru. From the establishment of the detention centres in late 2001 until mid-2006, Australia gave over $123 million in aid. Increases in Australian Overseas Development Assistance (ODA) have been directly tied to the Pacific Solution on Nauru. The way in which the Australian government has transformed the aid program in Nauru since 2001 has been criticised by a former staff member of the official Australian aid agency, who described the aid payments as "an unmitigated bribe" to ensure the Pacific Solution continues. Nauru's Foreign Minister has stated that money provided in the early years of the Pacific Solution under the previous government of President Rene Harris, was "basically just money poured into Nauru in order to ensure that the processing centre remains on Nauru." Analysis of the 2005-07 MOU raises serious questions about the focus and priority of Australia's aid program in Nauru, with serious imbalances in the allocation of aid. For example, from 2005 - 06, the aid program allocated $6.6 million for the Police Development Program, but only $2.1 million for health. The aid program to Nauru is tied to strict conditions requiring reform of economic and governance structures. Much of Australia's aid to Nauru is focused on covering costs and running services in the shortterm rather than building for the future. Many of these same services are under pressure because of the extra burden placed on them by the detention facility on Nauru. The Pacific Solution fails to uphold Australia commitment under international law to provide for non-refoulement of refugees - the principle under international law that forbids sending a refugee back to a place where s/he might face persecution - and for the principle of asylum. Australia's failure to respect these principles undermines the integrity of the international system. Under the Pacific Solution, there have been cases of refoulement of asylum-seekers to places where they faced danger and persecution, as documented in the report Deported to Danger. Australia's actions on asylum seekers violate the principle of burden-sharing - the idea that the global problem of refugees should be dealt with through international co-operation, with all nationstates contributing towards the solution. Australia is the first developed country to engage in a solution to the problem which effectively involves making other countries do the work - by offloading asylum-seekers on poorer Pacific countries and expecting other resettlement countries or transit countries such as Malaysia or Indonesia to host the asylum-seekers. According to DIAC figures, 58 per cent of those found to be refugees or humanitarian cases on Nauru and Manus Island between September 2001 and February 2007 have been offered places in Australia (616 out of 1064 refugees and humanitarian cases). This does not adequately fulfil Australia's national responsibility towards those claiming asylum in Australia. Various member states of the European Union, notably the United Kingdom, have been considering moving toward an offshore processing regime premised on the Australian approach. Based on this study, A Just Australia and Oxfam Australia believe there is a need for urgent reform of Australia's asylum seeker policies. End the "Pacific Solution" and the offshore detention and processing of asylum-seekers on Nauru, Manus Island and Christmas Island. Instead, asylum-seekers reaching excised areas of Australia by boat should be processed in mainland Australia in the same way as other asylum seekers. Initiate an Australian National Audit Office (ANAO) performance audit into the full financial costs involved in offshore detention, processing and boat interception policies - including Christmas Island as well as Nauru and Manus Island - across all relevant Government departments. Improve processing standards to ensure appropriate access to legal assistance, medical care and social support, consistent with previous changes to Australia's refugee determination system outlined in the Palmer, Comrie and Commonwealth Ombudsman's reports and inquiries by the Human Rights and Equal Opportunities Commission (HREOC) - for however long offshore processing does continue. Ensure that asylum-seekers currently being held on Nauru have their claims processed quickly and be offered resettlement in Australia if they are successful in their claims, recognising that resettlement in the United States or other countries represents an evasion of Australia's responsibilities towards those seeking protection. Transform the overseas development assistance program to Nauru, following the permanent closure of the detention centres, in order to address Nauru's long term development needs rather than Australia's domestic political interests. The aid program should focus on the priorities of the Millennium Development Goals, re-focussed on poverty alleviation, primary health and basic education needs in Nauru. Engage in research to determine whether excision laws and offshore processing has impacted upon numbers of unauthorised arrivals. While there is a significant body of evidence to show the negative impacts of offshore processing, there has been no research conducted on the purported positive impacts claimed by both major political parties - that excision and offshore processing specifically reduces boat arrivals, thus reducing the number of people risking their lives in a boat journey to Australia. The evidence showing negative outcomes of this policy should be enough to urge policy makers to investigate whether this unsubstantiated policy goal is actually being attained. We also call on the European Union and other developed countries contemplating the introduction of offshore processing regimes to reconsider introducing such policies, in light of the costs and inefficiencies of the Australian policy, the threats it poses to the international refugee protection regime and the challenges it presents to international burden-sharing of refugee protection. EVERY asylum seeker processed in offshore centres such as Nauru under the Federal Government's controversial Pacific Solution has cost taxpayers more than half a million dollars, a report says. The report, by aid organisation Oxfam Australia and refugee advocacy group A Just Australia, says the "flawed system" fuelled mental illness in refugees, failed to uphold Australia's commitment under international law and squandered taxpayers' money. It says that since the Pacific Solution was introduced six years ago, the Government has spent $1 billion - more than $500,000 a person - to process fewer than 1700 asylum seekers on Nauru, Christmas Island and Manus Island. "By comparison, the latest estimates from the Department of Immigration and Citizenship suggest that to process 1700 asylum seekers for 90 days each at the Villawood detention centre in Sydney would have cost around $35 million - around 3.5 per cent of the cost of processing them offshore," it says. Manus Island in Papua New Guinea had been empty since 2004, but was maintained at an annual cost of $2 million in readiness for new asylum seekers. Under the Pacific Solution - introduced following the Tampa crisis in the lead-up to the 2001 federal election - asylum seekers intercepted before they reach the Australian mainland are processed offshore. The report says the policy creates a two-tiered processing system, one for people within Australia and one for people offshore - which opens the way for discrimination and breaches of the international Refugee Convention. Australia has said it is not obligated to accept asylum seekers processed offshore even if they are found to be genuine refugees. "The Pacific Solution is neither value for money nor humane," Oxfam Australia executive director Andrew Hewett said. The report, A Price Too High, says medical studies, Immigration Department figures and testimony from staff and former asylum seekers on Nauru painted a shocking picture of psychological damage for detainees. Cases included 45 people engaged in a serious hunger strike and incidents of self-harm and attempted suicide as a result of prolonged isolation in offshore detention centres, where access to mental health services were limited or non-existent. The report documents long delays in resettling people found to be refugees, compounding post-traumatic stress disorder for asylum seekers. The report says the Pacific Solution failed to uphold Australia's commitment under international law, which forbids sending a refugee back to a place where they might face persecution. It recommends that the Pacific Solution be abolished and all asylum seekers processed on the mainland. Former prime minister Malcolm Fraser and Queen's counsel Julian Burnside will address a Tampa Day commemoration tomorrow at the north end of the Sandridge Bridge at 1pm. THE so-called Pacific solution for asylum seekers is a taxpayer rip-off that fuels mental illness among refugees and should be scrapped, a new report claims. The findings are from an analysis by aid organisation Oxfam Australia and refugee advocacy group A Just Australia released on the sixth anniversary of the arrival of the Tampa and its cargo of asylum seekers rescued from the Indian Ocean. The report analyses the financial, legal, human and regional cost of the so-called Pacific solution which sent asylum seekers to offshore detention centres. The solution was developed by the Government in 2001 in a crackdown on unauthorised immigration and to try to stem the numbers of asylum seekers accessing Australian courts in an increasingly costly litigation process. But the report said taxpayers have spent more than $1 billion since 2001 to process fewer than 1700 asylum seekers in Nauru, Manus Island and Christmas Island - a cost of more than $500,000 per person. "By comparison, the latest estimates from (the immigration department) suggest that to process 1700 asylum seekers for 90 days each at Villawood detention centre in Sydney would have cost around $35 million - around 3.5 per cent of the cost of processing them offshore," the report said. Most detainees have spent two years on Nauru, it said, with some being held for up to six years and many developing psychological illnesses in detention. "Most, if not all, of these asylum seekers have paid a substantial personal toll through poor mental and physical health and wellbeing," the report said. "There have also been detrimental impacts on Australia's democratic and legal system, Australia's regional relationships and the international system of protection of refugees and asylum seekers." Oxfam and A Just Australia recommended offshore processing be abolished. "We believe it is critical that the Australian government end the Pacific solution and the offshore detention and processing of asylum-seekers on Nauru, Manus Island and Christmas Island," the document said. "Instead, asylum-seekers reaching excised areas of Australia by boat should be processed in mainland Australia in the same way as other asylum-seekers." The report demanded an audit into the full financial costs of running offshore detention centres, and the scrapping of arrangements that allow refugees to be resettled in the US and other third countries. The report also called for an inquiry into whether offshore processing and the excision of islands from Australia's migration zone had decreased the number of refugee boat arrivals, as claimed by the Government. The Federal Government is expected to open a new detention centre on Christmas Island later this year, built at a cost of about $400 million. Deputy Opposition Leader Julia Gillard says Labor will end all offshore processing of asylum seekers if it wins the next federal election. Oxfam Australia and A Just Australia have completed a report which labels the Government's 'Pacific Solution' a failure. The report says offshore processing has cost Australian taxpayers $1 billion and mainland detention is 3.5 per cent the cost of offshore detention. It also says it has found offshore detention to be inefficient, unaccountable and has fuelled mental health problems of detainees. Ms Gillard says she is concerned by the report. "We have committed to ending the so called Pacific Solution, we would not have offshore processing in Manus Island and Nauru," she said. "I know the Oxfam report has gone through and tried to cost what all of that has cost the nation - it's not part of our vision for the future." She says taxpayers will be concerned about the report. "I think Australians, when the Pacific Solution started, probably looked a little bit in wonderment at it," she said. "As the information has come through, and obviously Oxfam has now played a role in that too, it's been clear to Australian taxpayers that this has been a very costly way of dealing with this issue." On Sunday, August 26, 2001 the Norwegian freighter MV Tampa sailed - in accordance with ancient seafaring traditions - to the aid of 438 people whose boat had sunk in international waters en route to Australia. Eleven days later, 353 people - also Iraqi and Afghan asylum seekers en route to Australia - drowned when their vessel, known as the SIEV (Suspected Illegal Entry Vessel) X sank in what was reported to be international waters off Java. Much conjecture remains about the precise location of the SIEV X, how much the Australian Government knew of its circumstances and how much - or how little - it did to assist its drowning passengers. But one thing is ironclad. By the time John Howard went to Australian voters a few weeks later on November 11, 2001, Tampa had become a verb, an adjective and a noun synonymous with the darkest of victories - characterised by Howard's acceptance speech "we will decide who comes to this country and the circumstances in which they come". Time lines are important, especially as we are in a similar one now. They remind us of how quickly - and how dramatically - things can be manipulated and wedged for political advantage. Tomorrow is the sixth anniversary of the Tampa's rescue of a boatload of people who were making unimaginably desperate journeys from persecution to a land of promise. Of the 438, only 28 made it to Australia, after years on Nauru. New Zealand welcomed most of them - almost immediately - the rest went to Scandinavia and North America. SIX years after the Tampa affair sparked a radical crackdown on illegal boat arrivals, 82 Sri Lankan and seven Burmese asylum seekers face an uncertain future on the tiny island of Nauru they describe as "no-man's land". Unlike detainees on the mainland, whose claims must be assessed within 90 days, those processed on Nauru can be left languishing for years. For one Sri Lankan asylum seeker, who has been on Nauru since his boat was intercepted by the Australian navy in international waters in February, the waiting is the hardest part. The 34-year-old man told The Age he had been interviewed by immigration officers in April but was told they did not know when his case would be decided. "People are worried ... they are thinking they will lose their future," he said. "Time is wasting here. We want to make a big future in our life." The man, who was a seafood exporter in Colombo, said he fled Sri Lanka after his business partner was shot and he had been beaten by unknown assailants. He said wealthy businessmen were often kidnapped and he feared for his life. The UN refugee agency said in its December 2006 report that Tamils in Colombo were vulnerable to abductions. Refugee advocate Susan Metcalfe, who has spent the past month on Nauru, said everyone was missing their home and family. "How can it be fair to leave these people here without telling them what will happen?" she said. One group of more than 50 asylum seekers spent more than 3½ years on Nauru. Half were resettled in 2005 after a mental health team warned that several were suicidal. "Today the same question, 'How long will I be here? ', is asked every day by current asylum seekers and sadly, again there is no answer," Ms Metcalfe said. EVEN now, as Mustafa Najib grips a letter offering him his freedom, he still believes something could go terribly wrong. That someone, one day, will approach him on the street, tap him on the shoulder and tell him there is a problem with his visa. Mr Najib, tall and softly spoken, smiles nervously as he reads the letter. "I am pleased to advise that your client has been granted a Subclass 866 (XA Protection) Visa," it says. It was addressed to his lawyer, but Mr Najib will keep it safe with other letters he holds dear, including those he received from a Melbourne woman during two years in detention on Nauru. It arrived on Wednesday, four days short of the sixth anniversary of the day Mr Najib and more than 430 others were rescued by the Norwegian vessel Tampa, which was later refused permission to unload its human cargo on Australian soil. For all that time, Mr Najib has lived a surreal existence, unable to plan for his future, unable to visit his family overseas, unable to be the master of his own destiny. Now, at last, he has the prospect of seeing his mother and the younger brother and sister he last saw in July 2001, when he fled Afghanistan. The visa means Mr Najib can complete his RMIT University degree, travel overseas and eventually apply for citizenship. Just as the visa offers a promise of protection, so, too, did the letters mailed to him by Halinka Rubin, who wrote to him in Nauru through a letter exchange program for detainees. He now calls her mother. During his two years in detention, he told Ms Rubin his story. Her story made her sympathetic to his: she was a Jewish child who fled with her family from Poland to the Soviet Union during World War II. She is 68, he is 29. Mr Najib grew up in Afghanistan but left in 2001 to escape the Taliban. He travelled via Pakistan, Singapore, Malaysia and Indonesia in a journey that cost more than $4900. He told Ms Rubin about his experience with the people smugglers and, finally, what happened on Nauru. "On one hand I was always waiting for his letters," Ms Rubin recalls, "but then I despaired when I got them." Ms Rubin started writing to detainees on Nauru in early 2002. "I once read about a Swiss woman who sheltered German Jews crossing the border during the Second World War," she says. "In most cases, refugees were returned back to Germany to their death, as they were considered illegals. People prefer to think that acting within a legal framework equals morality. But there is no morality in returning refugees back to mortal danger." Mr Najib smiles as he recalls the parcels from Ms Rubin. "She sent sweets and books," he says. "Her letters were the only thing inside the place, there is nothing else. When you open the letter, that is the only minute when you laugh or smile during the whole week." He describes his time on Nauru as a limbo. "I didn't know, nobody would tell me about my future or what would happen. You didn't know where you would end up, or whether you would be there forever." Then there was the all-consuming boredom. He survived by teaching himself English, picking up words and phrases from security guards and passing them on to other detainees. Two years after his rescue, Mr Najib finally landed on Australian soil. He was eager to meet Ms Rubin; he remembers holding her and crying. Ms Rubin, who migrated here in 1969, says she was nervous. "You know how it is, you can sort of hit it off in correspondence, but it is a strange person after all, and he may not like me." That evening, the pair dined on Ms Rubin's attempt at Afghan rice and her concerns were put at ease. "We can talk about anything," she says. "There is no topic we can't discuss, we do have a lot in common." When Mr Najib got the news of his permanent protection, no one was more overjoyed than Ms Rubin. "I feel happy and feel free," he says. But as with so many events in his life, there is also sadness. Sadness for his friends who were on the same, small, leaking boat but who still await permanent visas. For Mr Najib, the Tampa anniversary tomorrow is a day of reflection, a day to celebrate living and the friendships he has made. "It is a very special day for me, more important than my birthday. I thought that I died, and we were magically rescued. It was something unbelievable." He says it is also a time to remember those who have lost so much. Mr Najib is completing a degree at RMIT in international studies. He is also working part-time as an interpreter. He feels comfortable in his course, often achieving high distinctions. At the moment he is looking for a work placement and hopes to forge a career in human rights. As Mr Najib calls Ms Rubin his Australian mum, she, too, thinks of him as a son. Last year, he taught Ms Rubin how to send SMS messages. She cherishes the first one he sent her. "Mum, how r u?" it reads. "My 1st day of Uni was beautiful. Sleep well & good dreams. You helped me to live a normal life, the one every human deserves. Always love Mustafa."